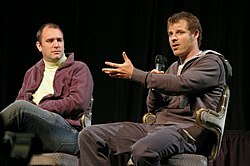 ^ a b c d e f g h Trey Parker, Matt Stone (2003年) (Audio commentary). South Park: The Complete First Season: "Pinkeye" (CD). Comedy Central.